St. Helena, CA – The 16th Annual Worlds of Flavor® International Conference & Festival welcomed 700 culinary professionals at The Culinary Institute of America (CIA) at Greystone from November 14 through November 16. They heard from 70 chefs and presenters from 15 countries who worked through more than 400 recipes during 53 sessions. 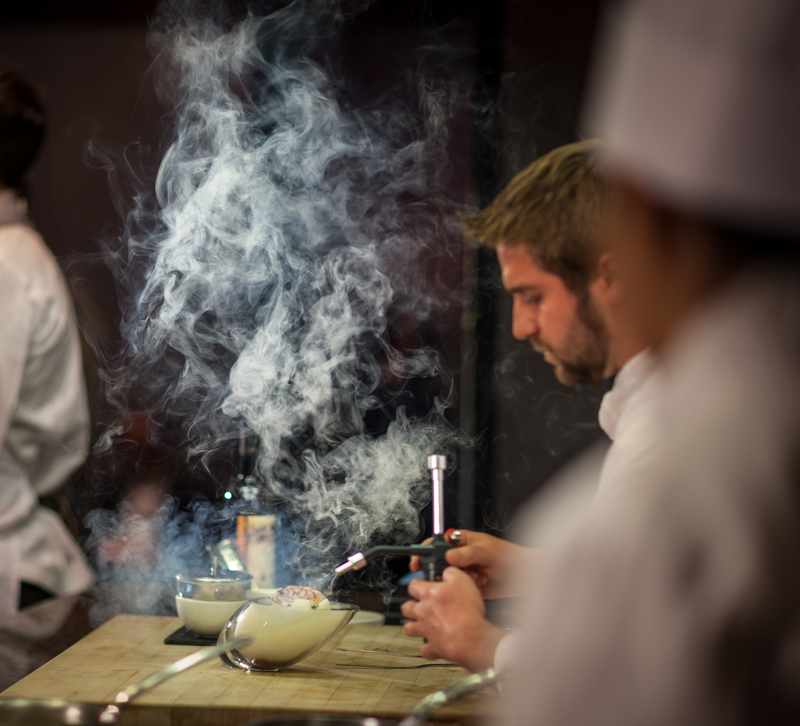 Under the theme Kitchens Connected, the program combined traditions and trends, fine dining innovations and comfort food memories, Millennial insights and information technology for restaurateurs. "Today's digital world offers à la minute glimpses into countless kitchens—and the culinary geniuses animating them," says Greg Drescher, vice president of strategic initiatives and industry leadership. "At this year's conference, we pulled back the curtain on some of the major ideas and dynamics shaping the future of the food world, here in the U.S. and around the globe." 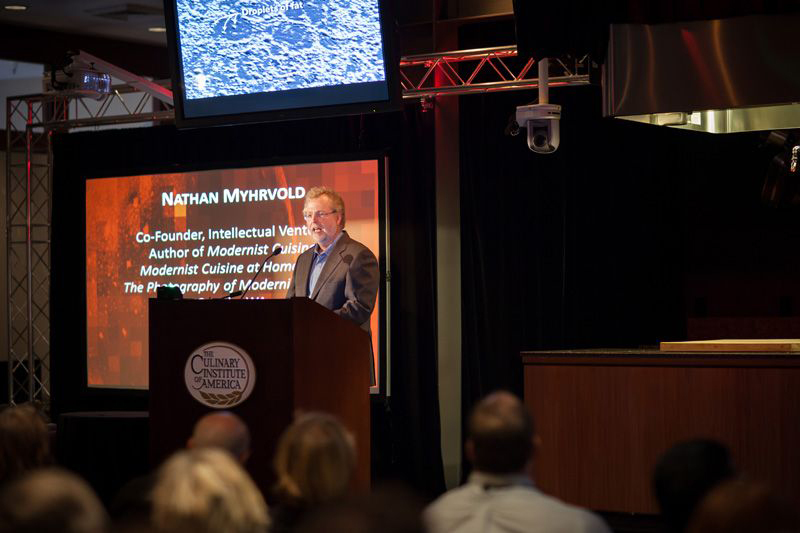 Nathan Myhrvold, CEO of Intellectual Ventures and co-author of Modernist Cuisine, proclaimed in his keynote speech a belief that strong skills in culinary basics—and a deep understanding of technique—are a prerequisite for culinary creativity. CIA alumnus Enrique Olvera, chef/owner of one of the top three restaurants in Latin America, compared culinary creativity to the art and science of architecture and demonstrated his Mole Madre, which is aged for more than 150 days. Josep Roca of El Celler de Can Roca—named the 2013 Best Restaurant in the World—explained the food, wine, and service principles behind the complete dining experience of his restaurant, stressing that El Celler is first and foremost a family restaurant. Claus Meyer, co-founder of Noma in Denmark and a leader of the new Nordic cuisine movement—and who is now replicating the experience in Bolivia—spoke passionately of the importance of using food to advance social imperatives. Thomas Keller, renowned chef, restaurateur, and CIA Trustee, was humble and inspiring with his words about creativity and his focus on his culinary team. The final day of the conference included a session on spontaneous culinary creativity, with audience participation. Four chefs—Maxime Bilet (chef and artist, Seattle), Stuart Brioza (State Bird Provisions, San Francisco), Kyle Connaughton (CIA, St. Helena), and Elizabeth Falkner (Corvo Bianco, New York City) were asked to create dishes using ingredients or techniques that had been suggested by the audience. Their "black box exercise" included raw milk, pomegranates, burdock root, and black garlic. 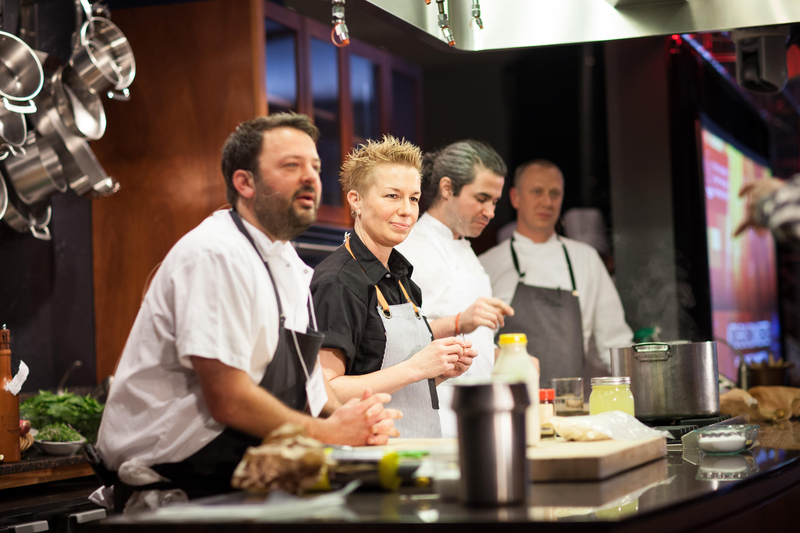 Elizabeth Falkner quickly set to sketching out her ideas. Stuart Brioza confessed that he had already hatched a dessert idea...until he saw the black garlic on the table. Kyle Connaughton channeled his Asian experiences and expertise, and Maxime Bilet reached for the sous vide machine and a blow torch. Dr. Tim Ryan, president of the CIA, closed the conference by citing examples of how and from where inspiration derives: Pablo Picasso adapted what he saw in ancient African masks to develop his revolutionary style; and over time, Bob Dylan continued to modify and revise "Like a Rolling Stone," one of the top rock & roll songs of all time. In painting, and music, as in the culinary arts—e.g., Paul Bocuse's truffle soup, Thomas Keller's salmon cornets, and Ferran Adrià's use of nitrous oxide containers for savory foams—innovative geniuses find stimulus for creativity everywhere. Dr. Ryan encouraged culinarians to have the confidence to build on the work of others to ignite inspiration and to try new things. "We are all surrounded every day by all sorts of hints and clues about how we can innovate," he said, "if we can only open our minds and recognize them." The resounding message of the presenting chefs, who hailed from the best kitchens in Western Europe, Asia, Latin America, and the U.S., was the importance of developing a sense of place in one's cuisine, expressed through ingredients, culinary philosophy, and the relationship between tradition and innovation in one's culture. The conference was trending on Twitter throughout the Bay Area and had a constant stream of photos on Instagram. A live webcast reached more than 40 countries and will soon be available on www.worldsofflavor.com. Worlds of Flavor: Kitchens Connected truly brought the world together through food. Each year, the CIA presents a portfolio of industry leadership programs and initiatives. The college's Worlds of Flavor International Conference & Festival is the premier educational forum in the USA dedicated to the discovery and exploration of world flavors, cultures, and cuisines. This year's Worlds of Flavor Conference was made possible in part through the generous support of Grand Platinum sponsor QUALISOY; Platinum sponsors Chobani, Foods from Spain, Japanese Ministry of Agriculture, JETRO, Unilever Food Solutions, and Wines from Spain; Premium Gold sponsors Google, Kikkoman Sales USA, Paramount Citrus/Wonderful Pistachios & Almonds/POM Wonderful, and Wood Stone Corporation; and more than two dozen additional foodservice partners. Founded in 1946, The Culinary Institute of America is an independent, not-for-profit college offering degree programs in culinary arts, culinary science, and baking and pastry arts, as well as certificate programs in culinary arts and wine and beverage studies. A network of more than 45,000 alumni has helped the CIA earn its reputation as the world's premier culinary college. The CIA, which also offers courses for professionals and food enthusiasts, as well as consulting services for the foodservice and hospitality industry, has campuses in New York (Hyde Park), California (St. Helena), Texas (San Antonio), and Singapore.